Join us for a meaningful and uplifting Passover seder in the Lower East side with the Stanton Street Shul community, where we will experience the exodus together and regard ourselves "as if we had come out of Egypt." All are welcome and all will feel welcome. Rabbi Bodner will be leading a community seder on the second night of Passover, Saturday night, April 20, at 8:20 pm, at the Stanton Street Shul. 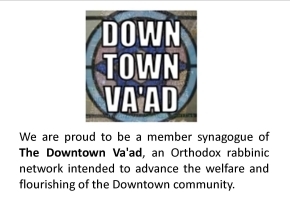 The cost is $50 person for Stanton members, $60/person for non-members, and sponsorships ($150 includes two seats at the seder) are available. Registration will close on April 10th. Financial assistance is available. For more information, please contact office@stantonstshul.com.